So far haven't had to many problems or complaints. Our move in date was pushed back due to our appliances not being installed but the problem was quickly fixed. Just the same as when we moved in . Great in all aspects of apartment living. 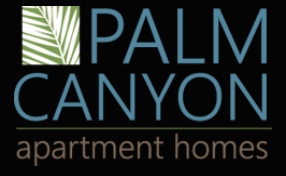 We're really comfortable here, and have no issues with Palm Canyon at all.The office and maintenance staff are always helpful and attend to our inquiries as soon as possible. Thank you Palm Canyon. I’ve never lived somewhere so poorly managed and maintained. Something breaks like every week here. It’s extremely annoying. No one who renovated my apartment took the time to make sure everything worked and was done right. I love it here. It’s so quiet and family friendly. The amenities are a life saver! It’s a nice neighborhood to live in. The apartment is super comfortable. I really like the living conditions and the staff are very friendly. I would recommend to anyone asking for a place to live. I can't think of any negatives. Palm canyon is a beautiful place to live in, we love the view we have our our window/balcony, it's priceless. We like the apartment as a whole, we would definitely renew our lease. Our ownlly concern is that they never came to fix issues we have had for 7 months, since we are happy inspire that we let it go, but we hope someday they would come by to fix those issues. So far it’s been really good. We’ve only been here a month and the staff is really friendly and is generally pretty quick about putting in service requests and having people come out to fix things for us... our ac was down and they came to fix it the next day. It was nice. I have enjoyed my time at Palm Canyons. It is in a great location. The palm trees and landscaping is beautiful. The office staff is very friendly and helpful. The maintenance team gets back to you in a reasonable time frame. The area is beautiful and that is what I feel like residents are paying for. The maintenance team is great and all the staff are friendly. I wish the office hours were a little later like 7pm. I've been for about a month, and I do enjoy the cleanliness of the environment and the courtesy of the staff. However, staff has lost important documents relating to my lease agreement twice now. Make sure you keep copies, and enjoy the comfy apartments! I've loved having a gym and pool, and the price is good, but the parking is difficult, and most importantly--we cannot get rid of all the cockroaches. I have been very happy here! The people have been very nice to work with. They are always helpful and nice to help with any issues or concerns that may come up. I enjoy living here, its peaceful & seems safe. Assistance for maintenance is given almost instantly if needed. Keep up the great work PC team! The front office is very helpful and professional. They made my move in very smooth and hassle free. So as of right now I think I made a good decision. Great place to live. It's close to work and stores where I shop. The neighbors are lovely! The view is nice. The staff is amazing; especially, Olivia, Angel, Leticia, and Alex!!!!!!! Hi Kelly- Thank you! Thank you! The team is glad that you are apart of our community! We hope to see you at the next event!! Please call us if you are needing anything at (520) 575-0400. Check us out on Facebook. The Palm Canyon Team! The apartment is very nice, all my family members like it very much. The neighbor is also very friendly. Further more, there are many tree in the apartment, we like it. Wonderful staff makes it simple to pick up packages or get questions answered. Kind and welcoming community. Well maintained and cleaned landscaping. Friendly neighbors and it seems like a good community. The apartment definitely could have been cleaner upon move in, but nothing a scrub didn't fix. I love meeting people while walking the paths but there are a few very negligent dog owners who do not clean up.